I was thrilled to pieces when I heard that Riley Blake Designs was going to be the U.S. distributor for Liberty of London quilting weight cotton. I've long been a fan of Liberty's gorgeous designs, and getting the chance to work with their new Hesketh House collection was such a treat. 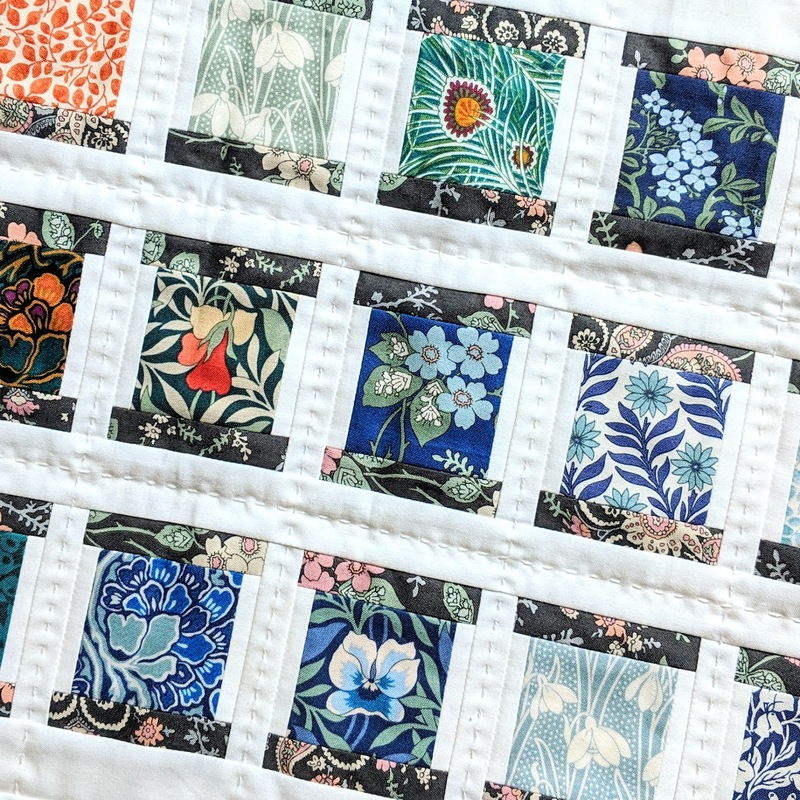 These prints have all the beautiful details of their famous lawn with all the durability of quilting cotton. 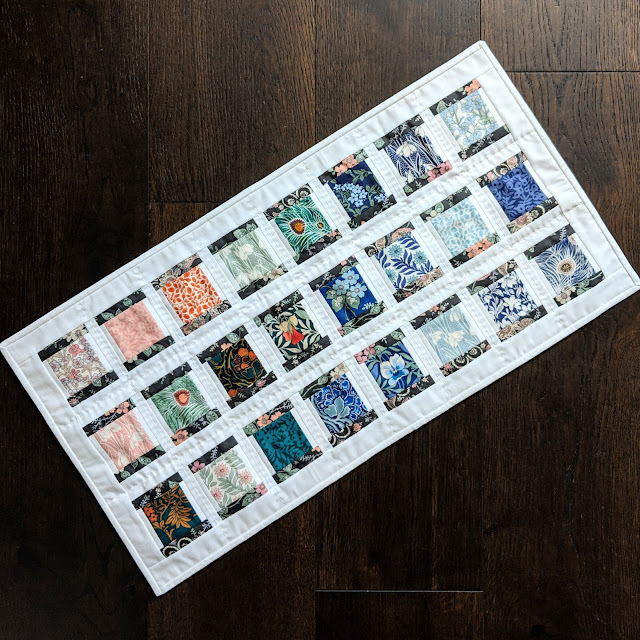 It's a quilter's dream! Because I wanted to showcase as many prints as I could in a table runner, I decided to do a very basic small spool block. Each spool has a different fabric as the thread, and then I used a black floral print for the spool ends to tie it all together. 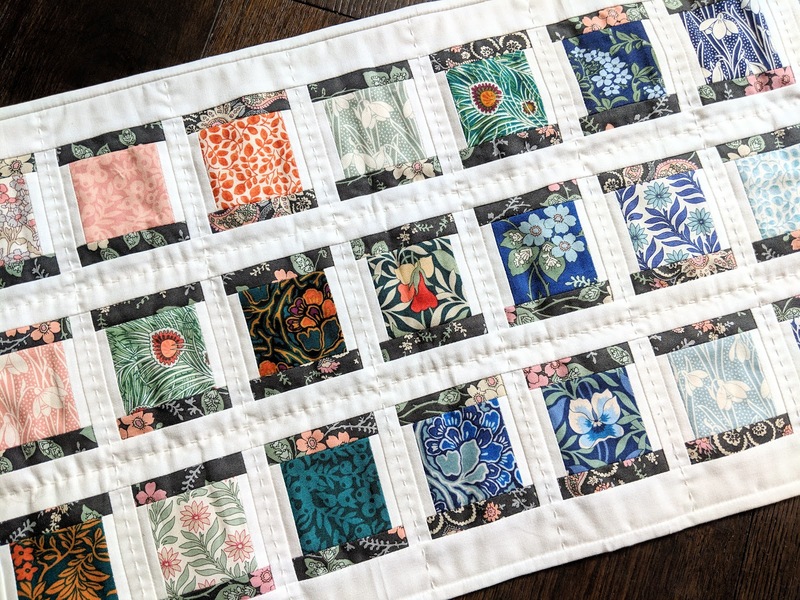 The piece is hand quilted in white Valdani Perle Cotton -- my first attempt with this thread, and it was such a pleasure to use. Hand quilting always adds so much lovely texture and personality, I think. A white solid works nicely for both the background and the binding so that all the focus is on those sweet spools. That is absolutely gorgeous! Love the way you used different fabrics for the ‘thread’ on your spool. It looks lovely. These prints are just glorious. I love it! I did not know RB is new US distilled for Liberty. Also love your new blog header. Very pretty table runner....I especially like the hand quilting. This is such a great showcase for all of those beautiful fabrics, so pretty! that is so cute. Is there a pattern? 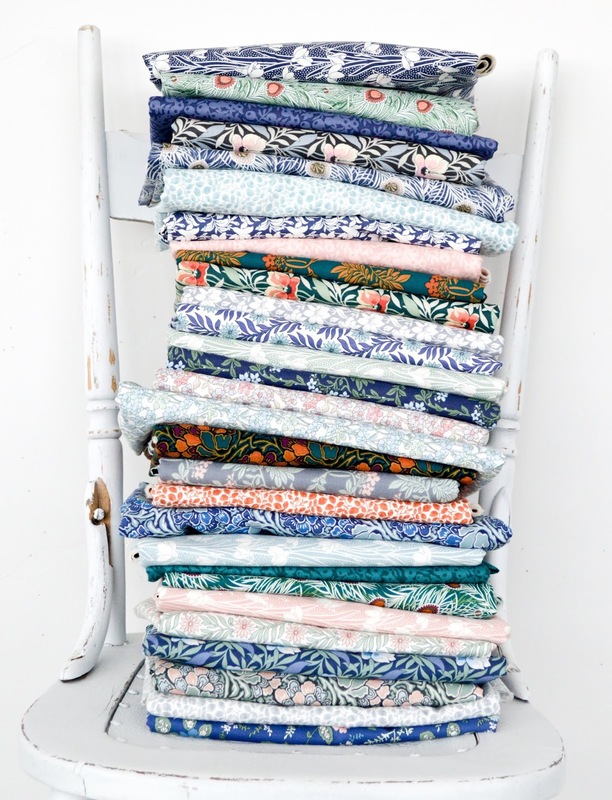 these fabrics are so, so beautiful! By any chance is there/will there be a pattern for the spool runner? Sew excited about the Liberty news! Tell me there will be a pattern for this runner! I just discovered your blog, I'm so glad I did. Your spool table runner is wonderful. I love scrappy quilts. The more the merrier I say. I lived in the Texas Hill Country for almost 30 years, and I live in Santa Fe NM currently. We love to visit during wildflower season. Look forward to future posts. I love your table runner! Is there a pattern for it? Also, I can't wait for your new book to come out! This is very exciting!! I love the liberty prints. Slowly adding to my stash. I'm looking forward to trying this new fabric on a project or two like your sweet runner.